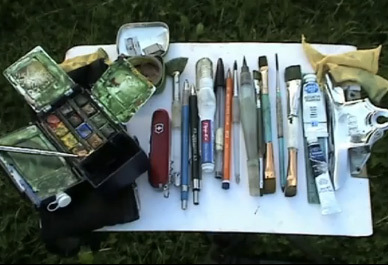 DRAWING AND SKETCHING, TOOLS and SUPPLIES. Choose where possible tools that are light and easy to carry around. When outside its handy to have an easily transportable light weight bag for your sketchbook with external pocket for camera and pencils. The bag is for short walks so a pair of walking shoes are always handy to always have in the car too. 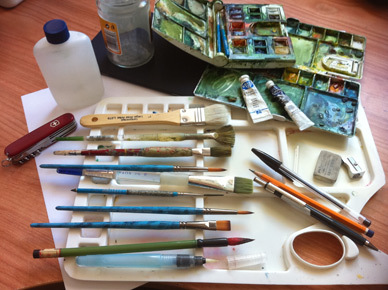 Have a small handy pencil case for small items that tend to be accumulated during your creative journey. **Camera ….preferably digital but any camera will do as long as you can get prints from it a mobile phone camera is good enough if you don't have a higher resolution camera.). If digital. A printer is also good to have but you can get your images printed from your memory stick at a service of your choice. **A small tube of White Gouache. **1 BIC Black Biro Medium. Ink Drawing Dip Pen and Watersoluble Black Quink ink. **One A4 Sketchbook (with good quality cartridge paper not watercolour paper The Black Card cover ones are best). **1 set of polly pockets. 1 pen knife (never bring on a plane!!!). **1 Good Size Portable Watercolour Palette (LARGE biscuit tin lids or plastic lids are ideal or LARGE white plastic pallets as available in most places). 1 Set Of Pans and including these colours. (if not available in your pan buy it as an extra in a tube). When Needed : Cerulean blue, Lemmon Yellow, Hookers Green, Burnt Umber, Alizarin Crimson. **1 Scriptliner ( also called a rigger ) Brush is very useful. This allows very fine lines to be painted in watercolor. **1 small clean (for now) Rag . **Small glass Jam Jar or plastic jar or similar in size. **Water in small small sealable container (for painting on walks,). 1 set of soft pastels. 1 LARGE Canvas to begin with. 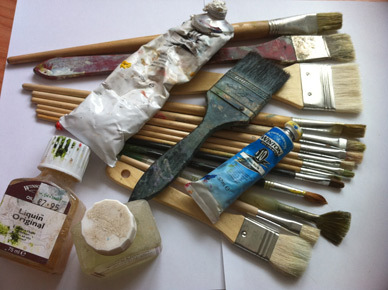 1 LARGE FLAT PALETTE (a small one is a complete waste of time) A template for making your own will be available.